SUSPEND BELIEF: BRP's all-new four-link TTX suspension with 20-in of travel features a trophy truck-like trailing arm and three links dedicated to controlling camber while delivering optimal geometry at all times, even during extended wheel travel. The result? Unparalleled power transfer to wheels, virtually no bump steer, precise steering response, and more confidence at higher speeds. OPTIMIZED WHEELS AND TIRES: Starting with 14-in aluminum beadlock wheels matched to 29-in. Maxxis Bighorn 2.0 six-ply tires, rough terrain has finally met its match. The Bighorn 2.0 features sturdy lugs and a non-directional tread pattern for both a compliant ride and sharp handling. 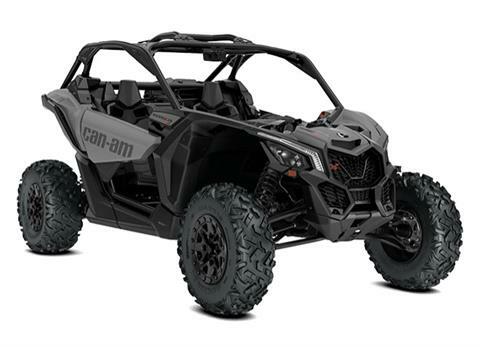 ADJUSTABLE SUSPENSION: The Maverick X3 X ds features fully-adjustable FOX 2.5 Podium RC2 HPG piggyback shocks with front and rear dual-speed compression and rebound adjustments, as well as rear bottom-out control to give the driver flexibility to fit the terrain and preferred driving style.